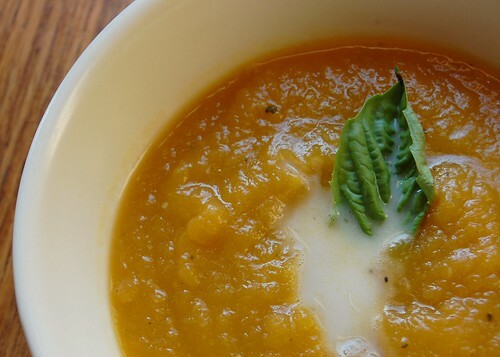 What exactly can you make with pumpkin puree? This easy soup, for example. My mother-in-law made it for Thanksgiving using cheese pumpkins. So, if you haven't already, don't forget to check out the pumpkin puree how to. And if you have, get ready to make some soup! This one's great with crusty bread . . .
Heat veggie stock, pumpkin, onion, garlic, salt, and pepper. Bring to a boil, reduce heat to low, and simmer for 30 minutes uncovered. Return to pot, and bring to a boil again. Pour into soup bowls and garnish with fresh basil.